​Into the Cold retraces two men’s dramatic expedition to the North Pole – one of the toughest and most magnificent environments in the world – and also one that is rapidly vanishing. In two months, 400+ miles, and -50F temperatures, the film reveals a deeply personal journey by foot to the top of the world as never before seen on camera. At current rates of climate change, this centennial commemorative expedition in 2009 will not be possible in another 100 years. Watch the trailer below or HERE. ​In 2010, explorer and photographer Sebastian Copeland and partner Eric McNair-Landry set off to cross 2,300 kilometers of the Greenland ice sheet in its length on skis and kites, and without support. Braving storms, crevasses, and exhaustion, the two men set fresh tracks and a new world record in the heart of the ice. 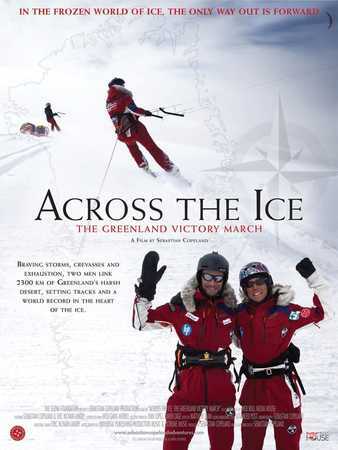 Across The Ice delves deep into the mindset of an expedition with spectacular footage of this rarely seen and arresting environment. This is their story. Watch the trailer below or ​HERE.